Playing casino games are a favourite pastime of many people and having a casino party can be a great way to combine the fun of playing casino games and enjoying an evening with friends. 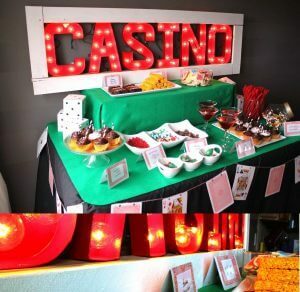 Homemade casino games are a great way to enjoy an evening with friends while creating a casino experience. Craps is one of those casino games that is based purely on luck and is a favourite among casino players. To make a craps game players will need to have dice and this is easily done by painting cubes of wood, eight red and eight white and then using a permanent marker to make the dots. The craps table template can be found online and this can be printed out and recreated. If players have a pool table the template can be placed on the inside, which will make to look like a real craps table. To make it look even more real players can buy a wooden stick for the crap sticks. 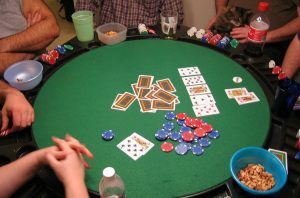 Card games are always a favourite at parties and include games such as Blackjack or Poker. To play card games players will need one or more decks of playing cards. The cards can either be bought or can be made using Adobe Illustrator or Photoshop. Each card should be 2.5 by 3.5 inches, which is the exact size. The same template is used to make the back of the cards. Players can make their own brand of playing cards by personalising the back using a photo for example. Creating a Roulette table may take a bit more time, but is definitely worth it as a casino would not be complete without a game of Roulette. Players can source an image of a Roulette wheel online and print it out and then place it on a circle of board. A hole is cut in the centre and to create the pockets players can weave pieces of wire together. For the centre of the wheel a salt shaker is a great idea, preferably a silver one to give it an authentic feel and placing it on a Lazy Susan will ensure the wheel can spin. For the Roulette ball a marble can be used. Pictures of the Roulette table and the chips can be found online and printed out. Chuck-a-luck is another great casino game and players may know it as Birdcage. This game is mostly played at carnivals and is a variant of Sic Bo and is also played using dice. For this game three dice are needed and these can be made in the same way as the Craps dice. An image of the Chuck-a-luck table can be found online and printed. For the tumbler two circles 6 inches in diameter must be cut using green felt and stuck to circles of cardboard of the same size. To make the shape wire can be used and bent. For these, 20 pieces of wire of 2 feet long is needed. The edges are bent around the circles on each end. Three 14 inch pieces of wire are then wrapped together to make a single 14 inch piece. The piece is then wrapped around the tumbler to make an hourglass shape. There are many sites online that can be helpful when making homemade casino games, and if you’re feeling adventurous you might even try your hand at home made slots!